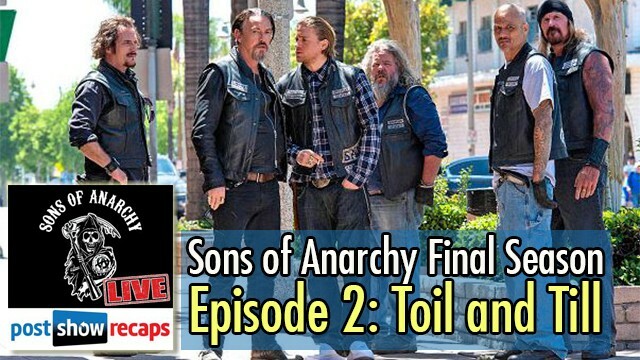 Rob Cesternino (@robcesternino) and Josh Wigler (@roundhoward) recap episode 2 of the final season of Sons of Anarchy, “Toil and Till”. What do we make of Jax’s plan to exact the revenge for Tara’s death on Lin and his forces? What could go wrong? What will be the fallout of Jax’s plan to make it look like the hired muscle from the Indian Hills charter were the ones to take out Lin’s guys? What was the relationship of Jury to the guy who got killed? Why did Juice let Unser go after taking his hostage last week? What is Unser’s end game? Who does he suspect killed Tara right now? What will Nero’s arc be over the course of the season? Can he redeem Gemma? How will Wendy play in to the final season? Will she end up being the mother to Abel?